Spotify Technology S.A. (/ˈspɒtɪfaɪ/) is a Swedish entertainment company founded by Daniel Ek and Martin Lorentzon. Spotify is a music streaming service that launched on 7 October 2008, is available in 65 regions, and is headquartered in Stockholm, Sweden. It provides DRM-protected content from record labels and media companies. Spotify is a freemium service; basic features are free with advertisements or limitations, while additional features, such as improved streaming quality and music downloads, are offered via paid subscriptions. Spotify is available in most of Europe, most of the Americas, Australia, New Zealand, South Africa, and parts of Asia. It is available for most modern devices, including Windows, macOS, and Linux computers, iOS, Windows Phone and Android smartphones and tablets, as well as the Playstation and Xbox One home consoles. Music can be browsed through or searched for by parameters such as artist, album, genre, playlist, or record label. Users can create, edit, and share playlists and tracks on social media, and make playlists with other users. Spotify provides access to more than 35 million songs. As of May 2018, it had 170 million monthly active users, including 75 million paying subscribers. 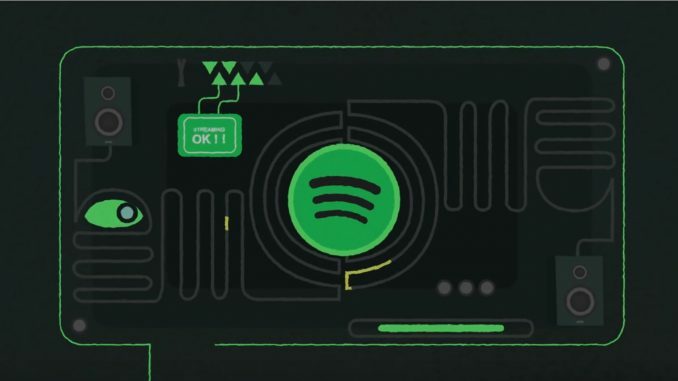 Unlike physical or download sales, which pay artists a fixed price per song or album sold, Spotify pays royalties based on the number of artists’ streams as a proportion of total songs streamed. It distributes approximately 70% of total revenue to rights holders, who then pay artists based on their individual agreements. Spotify has faced criticism from artists and producers including Taylor Swift and Thom Yorke, who argued that it does not fairly compensate musicians. In April 2017, as part of its efforts to renegotiate license deals for an interest in going public, Spotify announced that artists will be able to make albums temporarily exclusive to the Premium service if they are part of Universal Music Group and Merlin Network. On 28 February 2018, Spotify filed for direct listing on the New York Stock Exchange. Spotify’s shares began trading on 3 April 2018. Spotify has attracted significant criticism since its 2008 launch. The primary point of criticism centres around what artists, music creators and the media have described as “unsustainable” compensation. Unlike physical sales or legal downloads, which pay artists a fixed price per song or album sold, Spotify pays royalties based on their “market share”—the number of streams for their songs as a proportion of total songs streamed on the service. Spotify distributes approximately 70% of its total revenue to rights-holders, who will then pay artists based on their individual agreements. Multiple artists and bands have given harsh critique to Spotify over its payment policy, with the most notable examples being Thom Yorke and Taylor Swift, two hugely successful artists who withdrew their entire music collections from the service. Their content has since been restored. While the streaming music industry in general faces the same critique about inadequate payments, Spotify, being the leading service, faces particular scrutiny due to its free service tier, allowing users to listen to music for free, though with advertisements between tracks. The free service tier has led to a variety of major album releases being delayed or withdrawn from the service. In response to the allegations about unfair compensation, Spotify claims that it is benefitting the industry by migrating users away from piracy and less monetised platforms to its free service tier, and then encouraging them to upgrade to paid accounts. A study has shown that record labels keep a high amount of the money earned from Spotify, and the CEO of Merlin Network, a representative body for over 10,000 independent labels, has also observed significant yearly growth rates in earnings from Spotify, while clarifying that Spotify pays labels, not artists.